There seems to be a bit of an identity crisis on the left of politics these days. There are big challenges ahead but we seem to be more splintered than ever. We are faced with runaway climate change and rising global fascism. The distribution of wealth is massively tilted in favour of the global 1%. Corporations dominate our economies and structure choices about everything from food production to environmental policy on the basis of profitability and digital metrics. Add to that the massive expansion of the security state, anti-protest laws, surveillance technologies, facial recognition software and the constant corporate data collection we unwittingly allow via social media. It should be obvious to us that the big issues are environmental crisis and this rising totalitarianism, but perhaps it all seems too big sometimes. This is a time when we really need to build connections beyond habitual activists and reach out to anyone from across the spectrum of society who isn’t a climate denying neo-fascist to stand together as communities of real humans in nature to resist extremism and ecological catastrophe and to invent a new future for ourselves. Unfortunately some of progressive politics has splintered into identity politics campaigns that although laudable for their desire to bring the plight of vulnerable minorities into mainstream awareness are sometimes very alienating for a lot of mainstream people, especially working class and less educated people. Being lambasted on social media for not being abreast of the latest politically acceptable language can quickly alienate people and worse may actively help funnel people into the arms of right wingers. Social movements work best when they are inclusive and bring the population along with them. Lock the Gate is a great example of a movement that has been able to cut through the things that divide people and build community around the things that unite people. The marriage equality movement also did a good job of building their case within the broader community and utilising inclusive framing. That was identity politics but it was done inclusively. It is not the causes that are the problem, but it is sometimes the way people prosecute their case. Ironically it probably takes a good education and some degree of social privilege to move in the circles that know the latest acceptable language, so if we want to bring people with us we need to do the long slow work of awareness raising in a compassionate way. Social media is also part of the problem due to the “echo chamber” effect, where people get a feed of views that support their own and may forget that their campaign is new to some. This tends to breed intolerance and a culture of flaming and shaming those who cross what may be relatively new norms. There are worse examples though, violent mobs trying to shut down talks by intellectuals they don’t agree with; general disrespect for freedom of expression and artistic freedom; questioning long standing principles of the rule of law like the presumption of innocence; and organised violent resistance to right wing groups in the street, risks normalising the tactics of fascism in the name of fighting it. Non-violence and civil disobedience by united communities in inclusive social movements, supported by well-developed civil society organisations is the proven way for the left to bring about change and now more than ever this is needed. Social movements know that you need to bring the population with you. Our collective lifeworld is threatened like never before. The lifeworld is the lived world of nature and of our planet and all of its species including humans. We can never actually be disconnected from the lifeworld, but we are certainly capable of mass delusion and mass psychosis where we grow to misunderstand our deep connectedness to it. In fact human centred thinking (anthropocentrism) is one of those mass delusions. We are not the most important thing happening on this planet, everything else on the planet is. We are at the start of the tipping point of runaway climate change in which mass extinction is a certainty and human extinction a significant statistical risk. The social upheaval that we can expect to be associated with the breakdown of ecological systems means that we really need to strengthen our collective bonds in community, our respect for human rights and our connectedness to the planet. In these times one of the most radical political positions you can adopt is to push for a legal and economic system that is consistent with physics and ecological science. Our earth already has governance principles, understood by First Nations Peoples and by modern physics. But the global economic and legal system is not currently operating in accordance with these principles. Climate change is the first and most obvious of many signs that we are operating far outside of the governance principles of the lifeworld. The task for humanity is huge. I personally doubt that our governance systems will be turned around until they have more than proved their unsuitability. 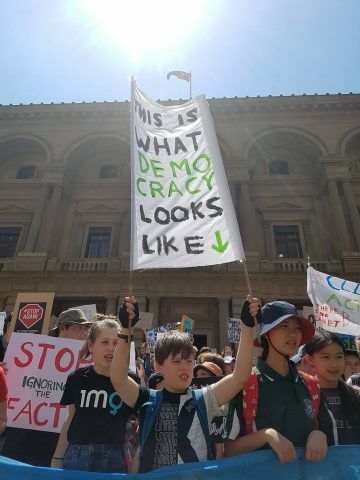 The spectacle of vested interests funding climate change denial to serve immediate profit over responsiveness is an example of how resistant to change these major institutions of capital are likely to be. Governments similarly seem more concerned about maintaining control for its own sake (totalitarianism) than responding to looming ecological catastrophe. I don’t think we are going to smash capitalism, we are going to watch it hit an iceberg at full speed. We may not be able to turn around our runaway and psychotic systems in time, so the change that we need will have to come from reconnecting to the life world, to lived human communities and sowing the millions of seeds of renewal and re-emergence. The renewables industry is a good example of a seed of renewal sowed for decades by off the grid hippies that has suddenly proven to be a major part of any sensible response to carbon reliance. But there will be many more. Multiple experiments in food production, energy sustainability, transport, building new communities that work together and support each other and in repairing the earth are our pressing tasks. Sowing these seeds of re-emergence has become urgent. The titanic is accelerating towards that ice berg and we need to launch the life boats regardless of what the captain says. In this we work together as communities, as species as races and as genders. Now isn’t that interesting. We are not going to secure a collective future by fighting amongst ourselves. Go gently with your neighbours friends and with strangers on Facebook my friends. Try to put aside the cultural differences that divide us, find the common ground and work for our very survival and for the planet. I may not agree with everything you say but I will stand with you in the coming catastrophe. This article was originally posted in the December 2018 issue of the Nimbin Good Times.